BRUSSELS - The countries that use the euro pulled Greece back from an imminent and potentially catatrophic default on Tuesday, when they finally stitched together a 130 billion euro ($170 billion) rescue they hope will also provide a lifeline to their common currency. But the patchwork of measures - including the implementation of austerity measures in Greece and approval by skeptical German and Dutch parliaments - required to give the rescue even a chance of success means it's unlikely to be the end of the continent's debt crisis. 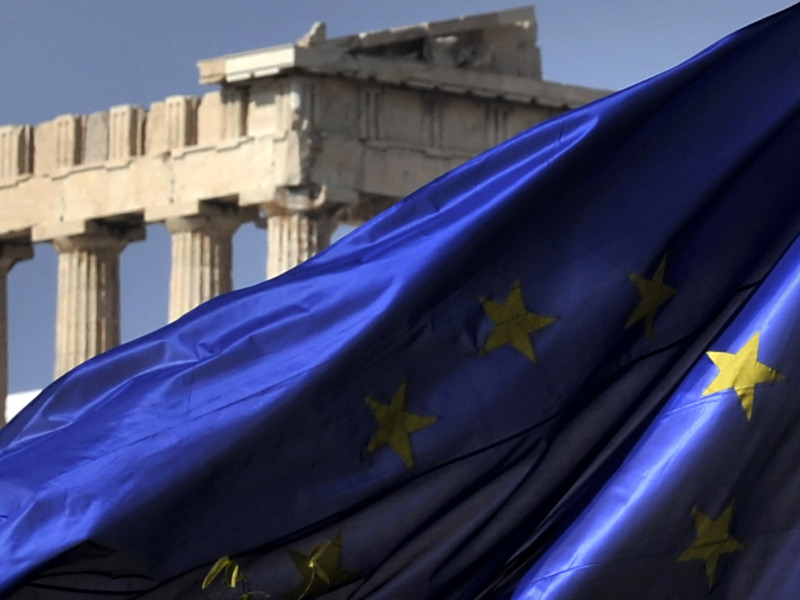 Week ahead: Will Greece prevent Dow 13,000? On top of the new rescue loans, Athens will also ask banks and other investment funds to forgive it some 107 billion euro ($142 billion) in debt, while the European Central Bank and national central banks in the eurozone will forgo profits on their holdings. Including Greece's first bailout worth 110 billion euro ($146 billion), the new deal means every Greek man, woman and child will owe the eurozone and the IMF about 22,000 euro ($29,000). The eurozone and Greece had been under pressure to reach an accord quickly to prevent Athens from defaulting on a 14.5 billion euro ($19.2 billion) bond payment on March 20. The fear is that an uncontrolled bankruptcy could unleash market panic across the rest of the continent, further unsettling other struggling countries like Ireland, Portugal or the much bigger Italy or Spain. The deal is expected to bring Greece's debt down to 120.5 percent of gross domestic product by 2020 - around the maximum the eurozone and IMF consider sustainable. At the moment, the debt stands at more than 160 percent of GDP. Ahead of the meeting, Greece's international creditors - the EU, the ECB and the IMF - warned that without new measures the debt would still remain close to 129 percent by the end of the decade even under its optimistic scenario. That shortfall persisted even though Athens had faced down violent protests to pass a massive new round of cuts and reforms through Parliament just last week. The representatives of private holders of Greek debt had to agree to steeper losses than they had earlier said was possible in a voluntary debt relief. The Institute of International Finance said the bond swap could see Greece's debt reduced by 107 billion euro immediately. On top of that, investors will be asked to give Athens 30 years to repay them, compared with just under 7 years. Average interest rates would fall to 3.65 percent from around 4.8 percent. The IMF also still has to decide how much of the 130 billion euro bill it is willing to stump up. Going into the meeting, the Washington-based fund had indicated its contribution will be lower than the one-third of the total it has provided in previous bailouts. At the moment, the overall ceiling for eurozone rescue loans has been set at 500 billion euro ($663 billion), much of which has already been committed to Ireland, Portugal and now Greece. Euro leaders will decide at their summit in early March whether that ceiling should be increased.